Some of you may have seen my sneak peek on Ellabella Designs' Facebook Page of a Thanksgiving project I was working on with my toddler. It is a wonderful project for the whole family, actually, and it's not too late for a last minute Thanksgiving craft activity for my readers in the United States! 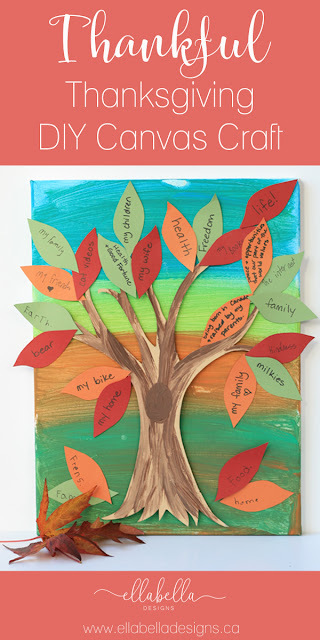 I think it turned out to be a beautiful piece of art, and I just love looking at it as a reminder of all of the things we are most thankful for. I didn't take any photos during the process of crafting it; however, I will give you a quick tutorial on how we made it! Paint (any color) - we used tempera paint, as I was working with a toddler! Start by painting the background of your canvas. We chose to use multiple colors horizontally to symbolize grass, land, trees, and sky; or you could paint a beautiful sunset. At this point, my toddler was going to town with the paint so I had to stop him and I didn't get to finish the sides of the canvas. Set aside the canvas to dry, leaving it high enough from the little toddler hands! 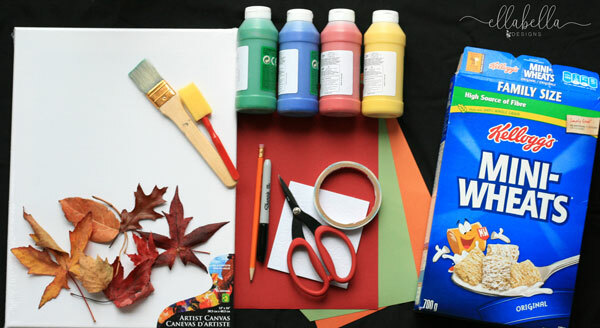 While the canvas is drying, open up the cereal box being careful not to tear it and sketch a tree shape. I had my daughter free-hand this, but you could find a tree you like on the internet and print it out then cut and trace it. Cut out the tree and paint it with light brown paint, use dark brown for accents. Set aside to dry. Using a leaf I found as the shape inspiration, I then traced leaf shapes on each color of cardstock paper. I cut out 25 leaves (5 leaves for each of us). 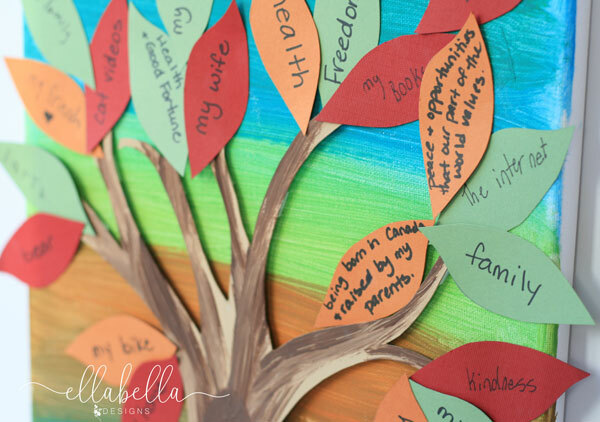 The kids, my husband, and I were each given 5 leaves and the task to write down 5 things we were most thankful for. Once the canvas was dry and the tree was dry, I attached 3D foam to the back of the tree (cutting some as needed for the smaller branches) then adhered it to the canvas. 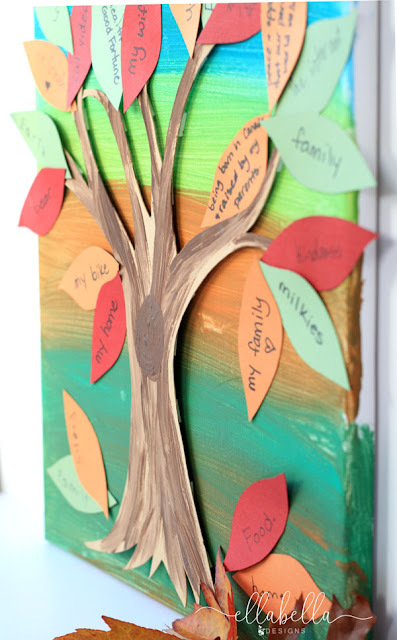 I then collected all of the leaves and adhered them to the canvas and tree branches using double sided tape. 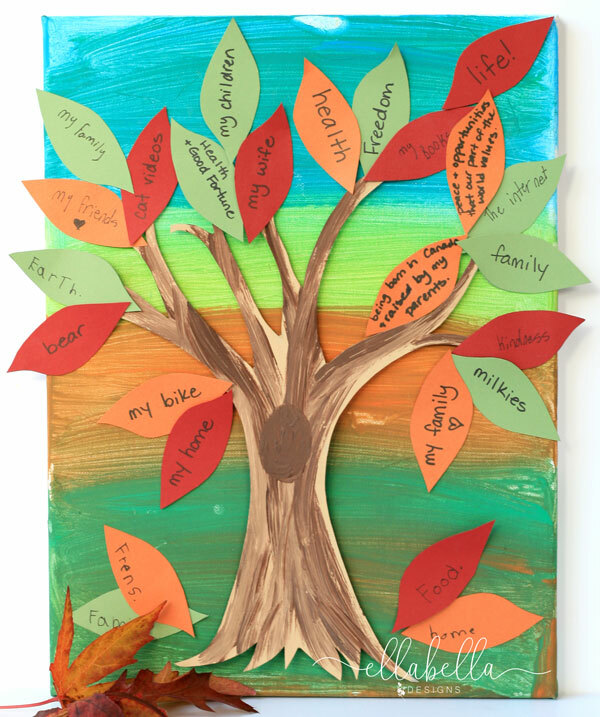 It was fun reading all of the leaves and seeing it all come together on the tree! You could use white glue to adhere the leaves, but my thinking is I will put up new leaves each year. 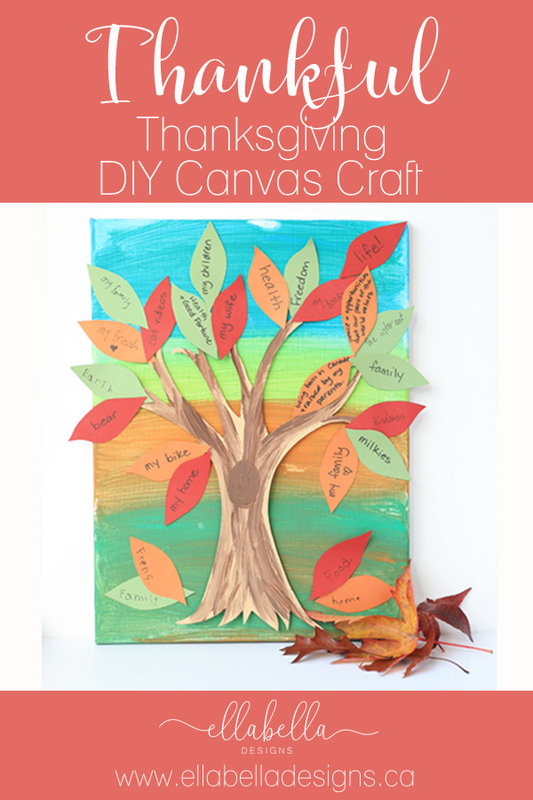 You could easily attach an envelope to the back of the canvas to slip in the leaves you are changing out. I hope this has inspired you to get crafting! I'd love to hear what you are thankful for! Leave me some comment love! I am extremely thankful for all of my readers! I truly appreciate each and every one of you!